"I remember what it was like before your ships showed up, before you Imperials ruined Lothal like the rest of the galaxy." Lothal, once a beacon of beauty in the galaxy, has replaced its natural beauty with industrialization. The Empire has mined its resources for its own nefarious purposes. What was once an environmentally rich planet has been corrupted and twisted by the Galactic Empire. Lush green plains have become a wasteland… and the site of your next battle. Fantasy Flight Games is proud to announce the Lothal Wastes Skirmish Map for Imperial Assault, now available for pre-order at your local retailer! The Lothal Wastes Skirmish Map for Imperial Assault is a 26” by 26” slip-resistant mat for use with your skirmish battles. Not only does the mat provide easy setup for your intense head-to-head games, it keeps them organized, neat, and mobile. Setting up the Lothal Wastes map now only takes the second that you need to unroll your mat. Once your match begins, you’ll soon find that the spacious borders around the map give you plenty of room to place your Deployment cards, Command deck, and tokens, while still keeping them out of the way of the action. The map even comes with its two Skirmish cards, giving you all the information you need for your battles at the tip of your fingers, whether you're diving right into the action, or controlling areas of immeasurable power. 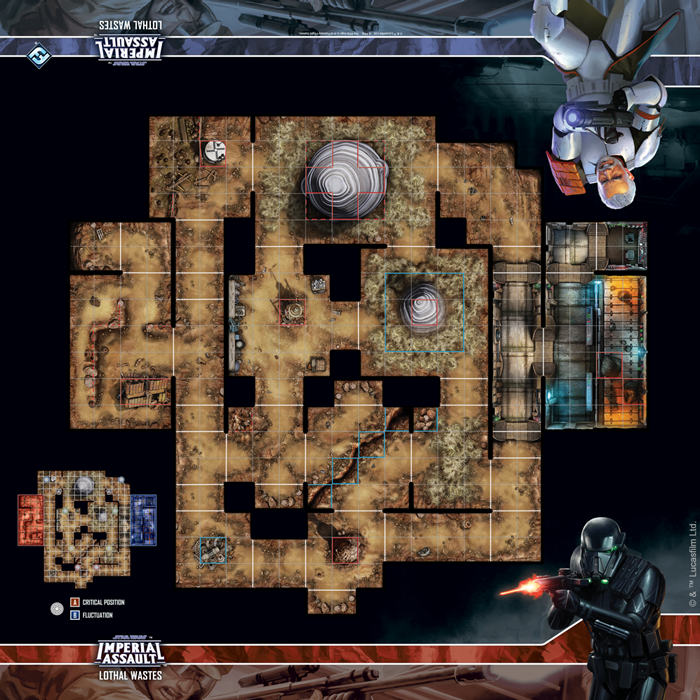 With powerful, thematic art of a death trooper and a grizzled clone warrior drawing you into the Star Wars universe, this skirmish map is the perfect site for your next battles. Whether you’re preparing for a tournament or just competing against some friends, the Lothal Wastes Skirmish Map keeps your games of Imperial Assault tidy, organized, and neat. Keep all your tools at your fingertips and dive right into the action of Imperial Assault! Explore the wastes with the Lothal Wastes Skirmish Map (SWI60) for Imperial Assault, available now for pre-order from your local retailer! Fantasy Flight Supply is a complete line of board game accessories to protect and customize your games.